Item #JR-72-B: 14Kt. 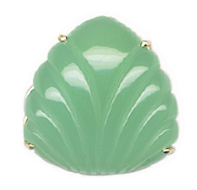 Yellow Gold slide pendant with 20x20mm shell shape carved Chrysoprase. Item #JR-72-A: 14Kt. Yellow Gold earrings with 15x15mm shell shape carved Chrysoprase and post backs. Ladys 14Kt. Yellow Gold Pendant with one prong set 4x6mm oval Chrysoprase Cab. 14Kt. Yellow Gold Pendant with one prong set 8x10mm oval Chrysoprase Cab. Item #GSJ-2535: 2 1/8" Long Lady's 18Kt. 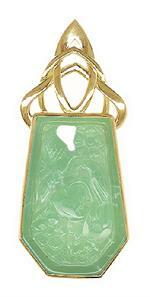 Yellow Gold Slide Pendant with one bezel set 21x31mm fancy shape Carved Chrysoprase with Bird, Fruit and Flower Design.